At the Oba's gathering event somewhere in Nigeria, Ooni of Ife, the young Adeyeye Enitan was greeting all other Oba's he met at the event, which is normal for all Oba's to respect each other. 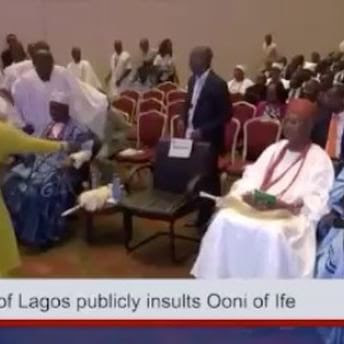 But surprisingly according to the video below, Oba of Lagos ignored Oba of Ife, while the Oba of Ife was trying to greet him, because the Oba of Lagos arrived at the event before the Oba of Ife. The young and humble Oba (king) of Ife greeted Oba of Lagos on the front row seats for the Oba's, but the Oba of Lagos decided to ignored him. This has led to many criticism by many Nigerians whom were not pleased by Oba of Lagos action and reaction to Oba of Ife.. All of us sees it as a disgraced and embarrassment to all Royal homes. Written by Olusola Planet Blog - Mariupol State University, Ukraine.